If UFC interim middleweight champion Israel Adesanya and light heavyweight Jon Jones were on a collision course, the two towering pugilists put the pedal to the metal this past weekend. Previously, Adesanya and Jones took competitive jabs at one another in the days leading to Adesanya’s title fight against Kelvin Gastelum at UFC 236 on Saturday. Initially, Adesanya claimed he was “hunting” another G.O.A.T., which forced Jones to lay down a warning for the young Nigerian. But now, two days removed from raising UFC gold in Atlanta, Adesanya is more than ready to breath some fire at Jones. Adesanya is, of course, referring to Jones’ previous suspension tied to his past cocaine usage. Unrelenting, “The Last Stylebender” continued his tirade on the public perception of Jones. Jones (24-1, 1 NC) is the current record holder for youngest champion at UFC history. Claiming gold against Mauricio “Shogun” Rua when he was just 23 years old in 2011, Jones’ résumé is nearly incomparable. 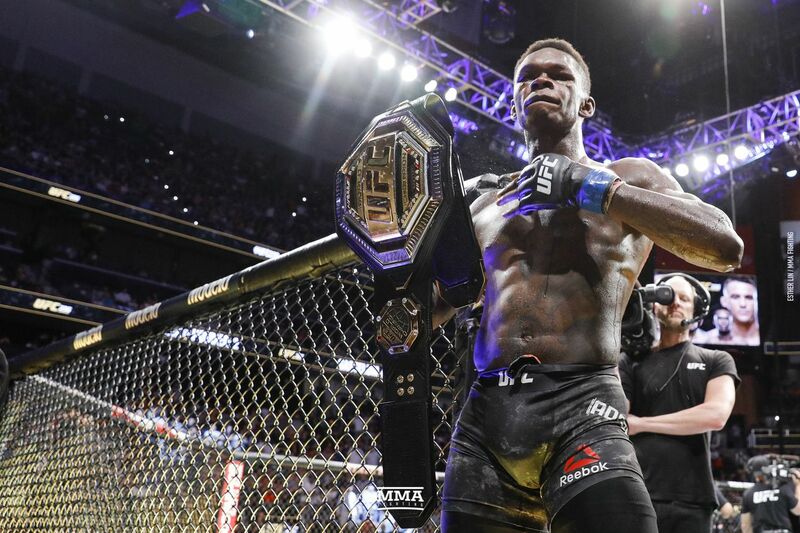 Adesanya (17-0), who claimed his first title at 29, went from UFC newcomer to champion in just 14 months, making him one of the few fighters on the roster who can match Jones’ meteoric rise. So, recognizing he’s still fairly new to MMA, Adesanya attributes Jones’ callout as more of a calculated move to face him before he reached his full potential rather than a legitimate rivalry. “Put it this way: if you want to beat me you’ve got to do it yesterday,” Adesanya said. “Every single fight I’m getting better. There’s only one reason he calls me out. I know [Jones is] a man of challenges. I’m not an easy fight but he knows if he wants to get me then the time is right now. I’m only a year and some change in this game. Imagine where what I’m going be in two years. He’s trying to get this fight this fight early so he has a better chance of beating me. But, I’m player one and I have the controller. So, that fight will happen but it will happen on my terms. Shaking off Jones’ criticism for seemingly struggling against Gastelum, a visibly annoyed Adesanya shifted gears back to his division. Declaring he had unfinished business at 185-pounds before he could play around at 205-pounds, including a title unification bout against injured champion Robert Whittaker later this year, Adesanya laid down one final warning. “[Ronaldo] ‘Jacare’ [Souza], Yoel [Romero], [Chris] Weidman, [Jared] Cannonier, these are guys still in line,” Adesanya said. “So, chill motherf**cker Jones. Let me get through the middleweights first and at least defend my belt a few times. I want to get through all of the top middleweights at least once and then I’ll move up. But, he’s trying to jump the gun — he knows I’m a challenge because, honestly, he’d have a better chance of beating me right now than a year or two years from now. He knows that. He’s a smart man and his coaches are smart. So, I don’t know if it’s all on him or someone is pushing him to ‘Get him now. Get him now while he’s still green.’ I’ve been bulled my whole life. So, when I peak, he’s going to get this. Update: Jones responded to Adesanya’s comments below. Bro how are you going to call me out talking about your “hunting the goat”, and then call me a bully for replying to you?? You sound like you know you can’t beat me right now, so if that’s the case, keep my name out your mouth and we won’t have these problems. Who called who out first?! Keep my name out your mouth! !